Learn French in Cannes with the EduKick France affiliated Collège International de Cannes! At the Soccer Training Info website you'll discover useful tips & training ideas! Live football online on your PC. Watch live football streams and feeds. We specialise in Premiership Football but also Champions League Matches. BB Portuguese offers quality Brazilian Portuguese services oriented to demanding companies and individuals, all provided by our certified linguists. Boot camps for troubled teens for parents who are looking for parent resources available for struggling teens. Get aware of information relating to teen boot camps alternatives with us. Translators - If you are looking for professional translators, then you are in the right place. We will offer you full-range of translation services for all your localization needs in over 100 languages: document translation, website globalization, software localization and more! Youth Soccer Equipment and...More - Assistance and advise on how to select a proper soccer equipment. Recommendations and tips for youth soccer players, their parents and novice soccer coaches. Golf Camps, Tennis Camps & Soccer Camps - US Sports Camps offers golf camps, soccer camps, tennis camps and many other camps for your favorite sport. At soccer camp you will improve your game and have a blast doing it! Online Animation College - Online-College-Search.net is the right place to find information on Animation Colleges, Animation Degrees or Online Animation Colleges. Search for the appropriate colleges for the right Degrees and courses. Graduation Gifts - Most unique graduation gift ideas on the planet! Funky theme sunglasses! Come see! Mastersport Soccer Skills - Free soccer skills tips, all about football articles, club information, football directory, football coaching software, and educational software. Attention Football Players The search is on for the next Davide Somma! 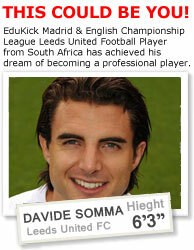 Former EduKick Madrid Player from South Africa, Signs with English Premier League Leeds United! Leaving school this year? EduKick are recruiting now for its year long football and education academies. Apply to secure your spot in the academy of your choice today. www.youthsoccernetwork.com - Youth Soccer Network is dedicated to promoting and creating awareness for youth soccer in North America. www.soccer-resources.com - THE Resource for Soccer! Learn how to speak Spanish fluently with an effective home study course. Everything about Portuguese - Brazilian & Portugal Portuguese, translators, curiosities, learning, fun and more! Got an idea for your website. Post your project FREE and receive bids from Professionals worldwide! Dolo Languages & Publications -Dolo Publications features Spanish, French, German,English/ESL and bilingual materials that blend language learning with the fine arts, especially music, literature, storytelling and theater. Materials for teachers/educators, parents, and children. Learning foreign languages should be fun!